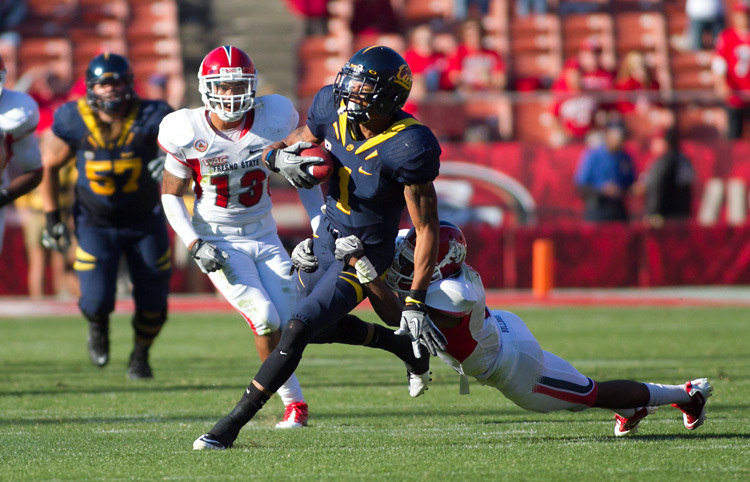 Marvin Jones (above) and Keenan Allen both had over 100 yards receiving, marking the first time two Cal receivers accomplished the feat in the same game since Lavelle Hawkins and DeSean Jackson did it in 2006. It was his first game in Division-I football since 2009, but Zach Maynard still graded himself rather harshly after his debut as Cal’s starting quarterback. Playing against a traditionally insidious Fresno State team, Maynard led the Bears to 19 first quarter points. For the first time since a 50-17 win over Arizona State on October 30, 2010, it felt like the Cal offense was actually capable of moving the ball. And Cal did dominate most of the statistical categories all afternoon in a game that saw noticeable offensive improvement and was highlighted by suffocating defense. — Maynard’s second throw of the game was a rather hideous interception that set up Fresno State’s first touchdown of the game, but he settled in and made an array of throws downfield and to the sidelines that showed the versatility that Tedford emphasized throughout Fall camp. Maynard tacked on five rushes for 70 yards on plays that Tedford said were designed runs. The offense utilized a lot of misdirection and draw plays that often caught Fresno State out of position. — Tedford admitted that there was “a lot of rust” and that the offense has “room to gel” but that he was happy with his team’s response after going down 7-0 not even two minutes into the game. — Receivers Marvin Jones (5 catches, 118 yards, 2 TDs) and Keenan Allen (8 catches, 112 yards) became the first receiver tandem with 100+ receiving yards since DeSean Jackson and Lavelle Hawkins did so on Sept. 16, 2006 in a 42-16 win over Portland State. — Isi Sofele set all kinds of career highs in his first-ever start at running back. The junior carried the ball 24 times for 97 yards and two touchdowns. His 39-yard touchdown scamper was also a career-high.Tedford admitted that he was concerned with Sofele’s ball security after a fumble in his own end zone resulted in a Fresno State touchdown, but backup running backs Covaughn Deboskie-Johnson and C.J. Anderson tallied only three carries between the two of them. — Until a 10-play, 64-yard touchdown drive late in the fourth quarter, Fresno State had only one offensive drive that covered more than 18 yards. Fresno State had only seven first downs at the end of the third quarter and finished with 11 for the game. — Fresno State appeared afraid to challenge the Bears downfield, as most of Bulldog quarterback David Carr’s throws came on screen passes and short crossing routes. His longest completion of the day, a 56 yard strike to Devon Wylie, came on an underneath route that Wylie broke into the open field after slipping behind the Cal secondary. — Cecil Whiteside’s forced fumble that led to Trevor Guyton’s first-ever touchdown (“That was my first one!” Guyton happily explained. “It was the best feeling ever!”) happened on his third-ever play in college football. — Defensive backs Marc Anthony and Josh Hill put on impressive defensive displays in both coverage and tackling. Hill executed a series of big hits that showed why he is considered one of the surest tacklers on the team. — Tedford emphasized this week that he was very happy with his depth on defense, and that showed this afternoon. Whiteside and fellow freshmen Mustafa Jalil, Viliami Moala, Brennan Scarlett and Chris McCain all saw extended action today. 15 players made their Cal debut including 10 true freshmen. — Both Tedford and several of his players mentioned the closeness of this team and how much room this bunch still has for improvement. Tedford used the terms “chemistry, togetherness and trust” while Matt Summers-Gavin called it “the closest team I’ve ever been a part of.” Defensive back Steve Williams and linebacker Mychal Kendricks both talked extensively about the closeness of this squad as well as its potential. — Was Summers-Gavin satisfied with the offensive output? “I think we could score twice as much as we put up.” Bold. — Cal was one of the few Pac-12 teams to represent the conference well on the opening weekend. USC eked out a win against Big-10 bottom-feeder Minnesota, Oregon turned the ball over five times in a 40-27 loss to LSU, Oregon State fell to lowly Sacramento State of the FCS, 29-28, while Washington barely survived Eastern Washington 30-27. UCLA turned in a solid offensive effort, but could not stop prolific Houston quarterback Case Keenum in a 38-34 loss at Houston. That makes losses to the Big-10, SEC, Big Sky and Conference USA. Ouch.